Canadian Loadshare offers greater steering stability, decreases leaf spring repairs and keeps the truck level. The system is capable of accepting 9,500 lbs. from front spring loads while maintaining truck frame height. Air pressure to the air bellows is regulated by an in-cab control Dual cab control is available and is used on snowplows equipped with wing towers and under graders. 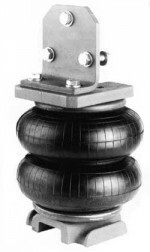 Level your heavy vehicle to provide a more comfortable, safe ride with less wear and tear on your vehicle’s springs. Loadshare is an airspring that is located between the front springs and the underside of the vehicle or trailer frame. The Loadshare system transfers up to 9,500 lbs. directly from the chassis to the axle. This is weight which is not applied to the leaf springs.